Dev on SEN right now. Good interview. Saying Dylan Shiel was the best junior he’s seen and he felt his best is still to come. Obvious excitement in his voice. Jake Stringer hasn’t missed a session and said he was flying. Kicked 7 in a practice game and gave some off. He said he’s expecting big years from Darcy & Langers. Thought Langford could really step up and the players around the club jokingly calling him Fyfy. Mentioned how important Orazio is. I’ll post the link when it comes up. A few more will need time alone after that interview. Did he just give him a ‘don’t argue’? Combining authoritative journalism and sharp-eyed analysis with emotive broadcasting, Gerard Whateley is a unique voice in the coverage of sport in Australia. The desk moved when I heard Dev talking about “Fyfy” being ‘anything’! He’s not missed a session. Put in the most minutes of any player. Looks like a beast. Moving well. Kicked 7 and gave 5 away in a practice game. And now with words you can read. Devon Smith is determined to build on his remarkable first season at The Hangar. Star midfielder Devon Smith says a new system and further improvement of Essendon’s versatile midfield group will allow him to hit the scoreboard more in 2019. Smith was sensational in his first season at The Hangar last year, claiming the 2018 Crichton Medal in a year in which he was gifted significant opportunities on the ball. Prior to arriving at the club, Smith said he felt ‘pigeon-holed’ as a small forward at Greater Western Sydney. 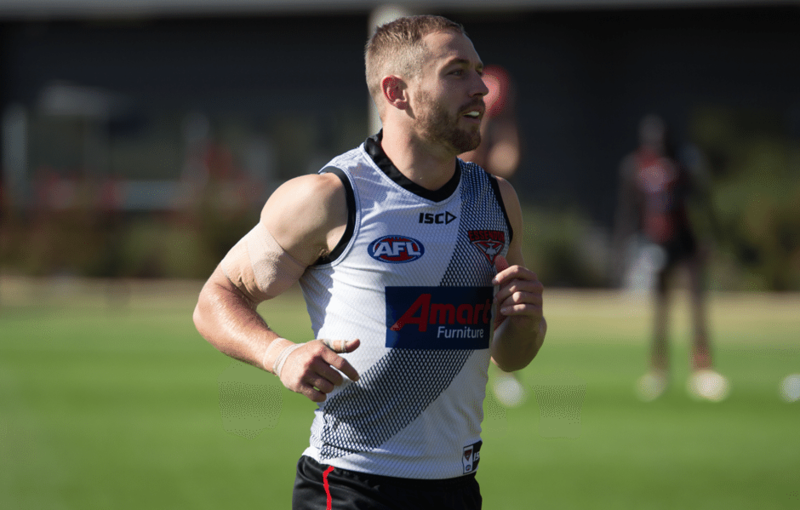 But encouraging support from Essendon midfield coaches Hayden Skipworth and James Kelly solidified his desire to don the sash. “I sat down with Hayden Skipworth and James Kelly and they could see a role for me in the midfield and playing forward, which was ultimately what I wanted to do,” Smith said on SEN on Tuesday. The former Giant exceeded many expectations last year, finishing the season with career-high averages for disposals, clearances, contested possessions and rebound 50s, and recording a club record 153 tackles. While his 17 goals proved Smith is still more than capable of making his presence felt in the forward line, he says he expects to elevate his game in front of goal this year. “Something the coaches keep telling me at the moment is not to do too much work and (to) get others who are in front of me to keep running and chasing, rather than to run past three people to chase, so that I can have an impact on the scoreboard,” he said. Midfield depth was one of the club’s key strengths in 2018 as the side ensured regular pairs of fresh legs could be utilised to take advantage of tiring opposing teams. Smith said the addition of former teammate Dylan Shiel and the natural progression of the side’s young on-ball brigade this year will see the Bombers share the load even more effectively. “It’s nice having Dyl Shiel come on board, he’ll take a lot of the midfield time up. “Andy McGrath and these (similar) guys are really coming on in their second, third and fourth years. Darcy Parish, the penny’s dropped for him, he’s working hard and I think he’ll have a great year. “Kyle Langford, who is a big prospect – I think he could be anything. The boys are joking at the moment calling him ‘Fyfey’ and he’s walking around the club with his chest out. The 25-year-old said he can’t wait to be back playing with Shiel after a spending decade of football by the 2017 All Australian’s side, and Smith claimed the new Bomber’s best is still to come. “I think the footy world will see actually how good Dylan Shiel is. “I think he was on par with the best junior I saw. I still don’t think he’■■■■■ his peak, even though he’s an All Australian already. He’s a serious talent. “It’s good, I don’t have to chase him around (any more). It’s just nice knowing that I know where he runs and he knows where I run. Smith is set to play some limited game time during Essendon’s first competitive hit-out of the year in Thursday night’s JLT Community Series opener against Carlton at Ikon Park. The full line-up for the clash will be revealed on Wednesday evening. Smith and Shiel to be a potent double act. Shiel in the side makes Smith even better, and Smith to help Shiel excel. It’s the sum of these additional parts that will make us a better side. lol - hit his peak perhaps? I can’t take anymore hype. Somethings going to go absolutely ballzup this year isn’t it? Yep. I suggest you place your 2020 premiership bet soon, those odds are going to be trashed beyond repair this year. Really impressed with that interview from both sides, well worth the listen.